The final match of the Ladies Inter-Service football competition would be a winner takes all event with the previous matches played all drawn. 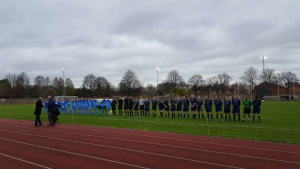 The RAF were in poll position though having scored in their draw with the Army, but goals were the required output for both teams. On a dull and overcast day with a mild breeze, the weather was significantly cooler than the previous outing. 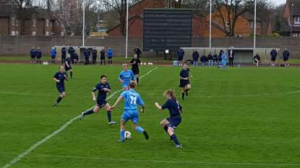 The RAF started brightly with Cpl Rachel Griffiths and Cpl Catherine Beaver moving the ball quickly out to the left to put them on the attack. Unfortunately, the ball ran out of play when it looked like they had got behind the RN defence. Another good pass from Cpl Catherine Beaver put SAC Keri Haywood through with a chance but the RN keeper LH Louise Worsfold was alert to the danger and sprinted out to the edge of her box to claim before a shot could be taken. SAC Samantha Wylie’s good work on the right created space to whip in her cross but Katie Shorter rose well and met the danger with a firm header to clear the danger. The RN were slow to start but on 11 mins a long ball from a free kick deep inside their own half caught out the RAF defence as the ball bobbled free to the on-rushing RN attacker but her attempt at getting a shot away was blocked by SAC Jo Vasey, undeterred she tried again but was again thwarted by good defending by Vasey. The match was a little scrappy with both sides conceding possession too easily at times. The RN did however look dangerous on the break with pace up front. AET Anthea Kaptein went on a jinking run into the RAF box but she was tackled well by SAC Laura Went with the ball being cleared to the edge of the box then quickly moved to SAC Nicola Symons who proceeded on a run down the flank, advancing under pressure for 2/3rds of the pitch but a fantastic sliding tackling from SLt Natalie Brierley who came across on the cover. 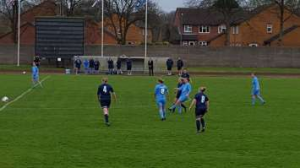 On 20 mins a long kick from the RAF keeper, Sgt Nicky Davies saw the ball land deep in the RN half and as the ball bounced SAC Sonyia Jones was fouled from behind. With the free kick 35 yards out, Cpl Griffiths stepped up to the ball and struck it sweetly but her effort went just high and wide of the goal with the RN keeper looking confident she had it covered. Soon after Beaver turned her marker and shot but pulled her effort wide of the near post. A real opportunity but she was under pressure as she got the shot away. Beaver then linked well with Haywood on the left side, who switched play to the on rushing SAC Kaye Widdicombe but AB Anne Timoney nipped in to clear. The RAF were in the ascendency with pressure mounting. A corner on the right saw Cpl Griffiths loft the ball into the box and Widdicombe met it well but her header looped over the bar. The RN reminded the RAF that they were dangerous on the break and had a couple of quick breaks that were just lacking accuracy on the final ball. A foul by Kaptein saw her name added to the Referee’s notebook. Cpl Griffiths delivered a fine ball into the box but RN keeper collected well after the knock down. On 32 mins, Kaptein produced a goal bound effort from 20 yards out but RAF keeper Davies gathered comfortably as the shot was fired straight at her. This spurred the RN on, with another attack down their left with Ciara Boylan curling a nice through ball to Natalie Bavister who crossed well to Logs Grace O’Leary. Her header was weaker than she would have liked and Davies gathered. Another chance that could have resulted in more. Haywood and Jones were working hard to keep the RN defence busy, chasing hard and closing down play. Good link up play between Haywood, Beaver and Symons worked the ball into the box for Jones to get a shot away from 10 yards out but the RN keeper did well to block the effort and was helped as her defence cleared. Almost immediately POPT Natalie Bavister went on another run down the RN left, beating her marker to deliver a low drive into the box, luckily Beaver was on hand to deal with the issue as she coolly intercepted and then cleared the danger. As the half was coming to a close, the RN were the team asking the questions. A solid tackle by Rachel Rutherford stopped one attack but with a minute to play AB Katie Bowden freed AB Nadina Green who slipped the ball into O’Leary, she laid the ball off to LPT Susan Badger who then dragged her effort wide from 12 yards out when she should have done better. Sgt Nicky Davies was the next in the Referee’s notebook when just before halftime she was cautioned for time wasting, much to the dismay of those watching. Half time – RAF 0 – RN 0. The second half started much the same as the first with the RAF fast out of the blocks seeing their initial attack go out for a corner. The corner was driven into the box and despite an RAF head getting on the end of the delivery, the header looped just over. The deadlock was broken on 53 minutes with Bavister sliding the ball to Boylan on the RN left, she steadied herself and then curled her left foot effort past Davies in the RAF goal. 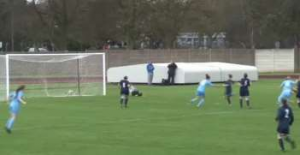 A well worked goal, RAF 0 – RN 1. The RAF responded with Griffiths going on a good run, having a pop at goal from 35 yards but it was not troubling the keeper. She then launched the ball forward and just when it looked like it was opening up, Rutherford produced a cracking last ditch tackle to divert the ball out for a corner. The corner was driven into the box and as Kaptein went for the ball she hand balled. Whether this was intentional or as a result of the challenge for the ball is unclear but the Referee deemed it to be an intentional act and quickly produced another yellow card which saw Kaptein sent off. 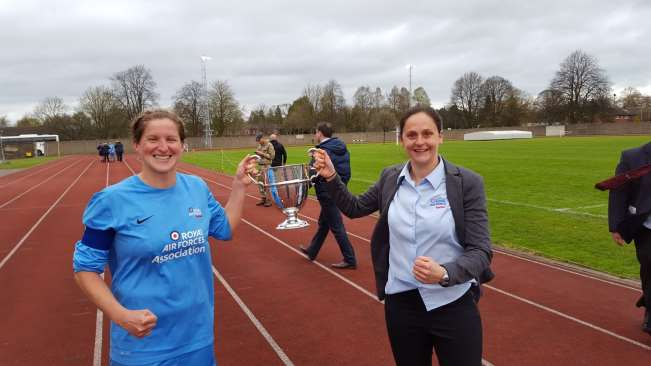 This changed the game with the RAF able to throw more players forward with Manager Michelle Harvey-Perkins withdrawing a defender to bring an attacker on in the 62 minute with SAC Laura Went going off and SAC Steph Lee replacing her. Still looking dangerous though the RN broke quickly. This attack might have come to more if it was not for a lung busting run by Griffiths and her sliding clearance directing the ball back to Davies to clear her lines. 66 mins – Sonyia Jones picked up an injury so was replaced by LAC Lauren Welsh. Pressure was mounting on the RN goal with shots by Symons from the right side of the box and then a good turn from Welsh and cross into the box being punched clear by the RN keeper, Worsfold but only as far as SAC Steph Lee who rushed her shot, putting it over. On 71 mins a great interception by RAF captain Beaver, saw her drive to the edge of the box and slide a pass to her midfield partner, Griffiths. Griffiths smashed her effort into the top right corner of the goal leaving the RN keeper with no chance of stopping it. A fantastic strike from 18 yards out. 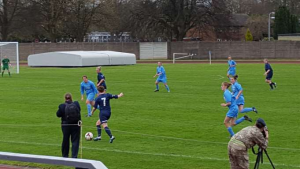 RAF 1 – RN 1.The final sub from the RAF saw Widdicombe go off and SAC Rachel Howes coming on after 75 minutes. The RAF nearly went into the lead when Haywood played a one-two with SAC Steph Lee, working the ball into the box but her goal bound shot was clawed around the post by a great save by the Worsfold in the RN goal. Minutes later a goal line clearance kept the scores level when it looked as if the ball was going to elude everyone. RN substitution was made with AB Green sub off, LAET Emma Field on. A RN attack was halted by a brilliant saving tackle by Rachel Howes when O’Leary looked to be lining up her shot. Several half chances followed for the RAF with Wylie lofting her shot over and Griffiths putting a 30 yard effort into the keeper’s arms. Stalwart defending by Rutherford and Howes preserved the level status but the RN were not done and on 45 minutes Bavister jinxed into the box only to be met again by solid defending by Rutherford with another well timed slide tackle putting the ball out for a corner. This prompted the RN keeper to join her teammates in the box. Bavister fired the ball into the box and Beaver was first to meet it. However, her header wasn’t what was intended as the ball flew past the post for another corner instead of out of the danger area. Field delivered the ball this time but the defence stood firm and cleared to the halfway line, where the Referee blew for full time prompting celebrations in the RAF ranks. 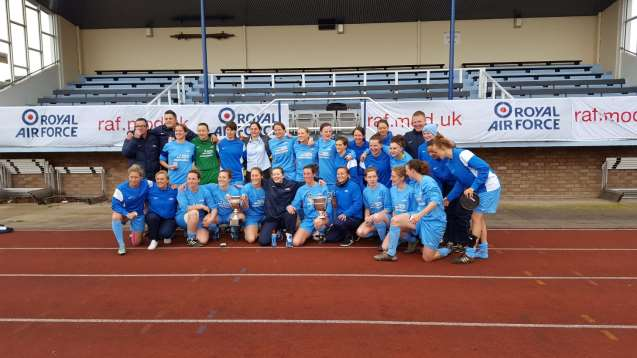 This meant that the RAF LRT’s had won the Inter-Services due to having scored more goals than the Army and RN with all matches drawn. A fantastic achievement for all involved from the Management Team, Backroom staff and Squad.